Side note: We’ll only be addressing the client side user experience, not the back-end development changes, in this article. At first glance, you may or may not notice many differences as soon as you update your website to Gutenberg. 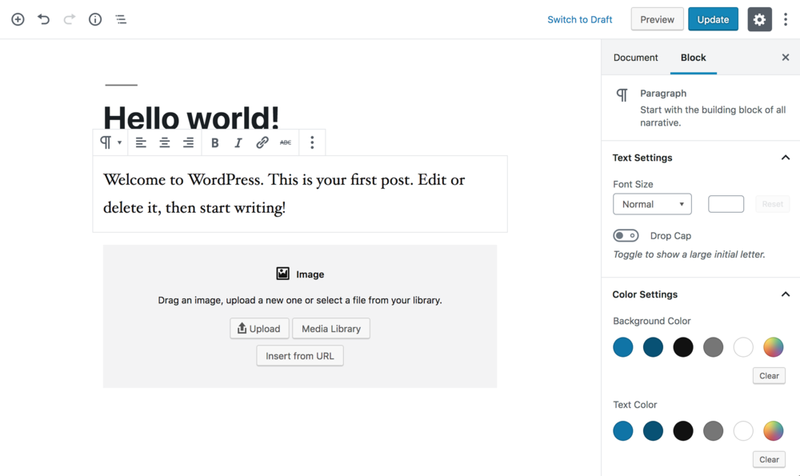 But look a little more closely, and you’ll discover the entire Wordpress editing experience has changed. The latest version of Wordpress uses a series of blocks (dare we say strikingly similar to Squarespace?) to add a variety of content and more advanced layout options. It’s pretty clear that Wordpress is trying to compete with WYSIWIG site editors like Squarespace and Medium that offer a more user-friendly and straightforward site editing experience. What happens when I update to Gutenberg? After updating your Wordpress site to the latest version, you could notice that some of your plugins do not function properly or your content may look different dependent upon your theme setup. Or there could even be a bug that breaks something. While many plugin and theme developers have updated their support for Gutenberg, a large number have not. So it’s best to test the update comprehensively on your staging environment before making it live. It’s important to note that once your site updates to Gutenberg, or Wordpress version 5.0, this will be your default editing experience. You can temporarily enable the Classic Editor from the plugins panel if you find the Gutenberg experience too difficult to navigate, however the classic editing experience will eventually be phased out. So you’ll need to educate yourself on how to use the new block-based interface sooner or later! Your existing post content will be converted to one large “Classic” editor block. 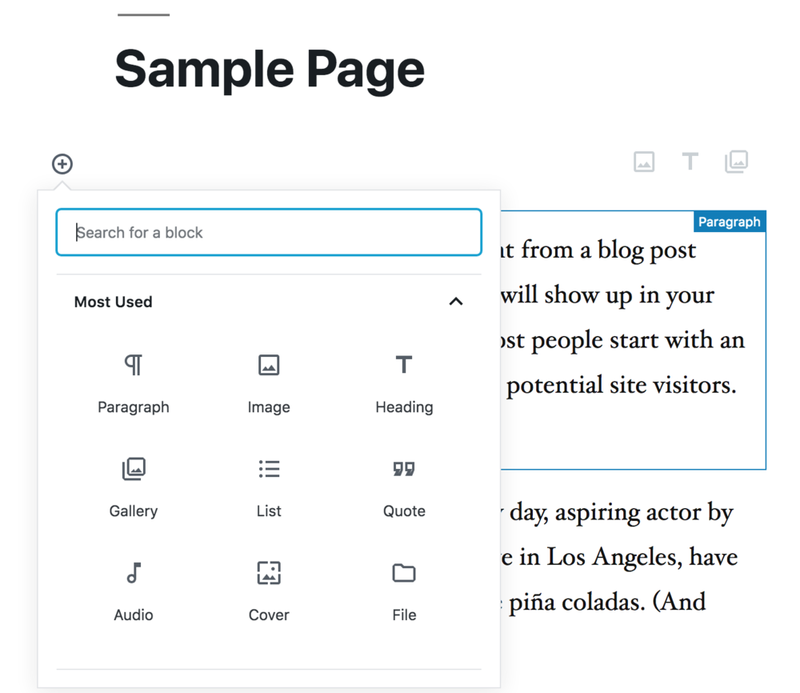 This is intended to preserve the format of your page and post content, however you have the option to “convert to blocks” to take full advantage of the Gutenberg editor. If you use a site builder like Elementor or Divi, it’s recommended that you research to see how your content will be affected prior to updating and test compatibility on your staging environment. What should I expect with Gutenberg? The new editing interface is focused on “writing first” so you’ll notice a more minimalist user-experience and larger screen area for writing and editing. You can change your screen views to fit your editing style and hide all menus and sidebars for the most minimal editing experience. The biggest change you’ll notice is the new block-based user interface. If you’ve used any page builder like Beaver Builder, Elementor, Divi Builder, or Visual Composer then you’ll find the interface a bit more familiar. All content types can be accessed from the comprehensive block menu and added to a page or post, then edited to create a custom layout. Another thing you’ll recognize is how well Gutenberg works on a mobile device. You can make site changes quickly and easily on-the-go. Then there are Reusable Blocks that allow you to reuse content across multiple pages or posts. Each block has its own specific settings, visual styles and customizations right out of the box. You can also add custom CSS classes directly to your blocks to style them individually. Adding a block to a page or post is an easy process and there are several ways to add them, allowing you to choose the workflow that works best for you. It’s now much easier to add a simple button or call-to-action to your posts or pages and you can even get a summary of your total word count and number of blocks and headings being used. WordPress 5.0 and Gutenberg is the biggest Wordpress update that we’ve seen in a very long time. It affects all Wordpress users, from those that write and edit content to developers that code plugins and themes. Though change is never easy and Gutenberg comes with some growing pains, overall we’re encouraged by the changes. But no matter what, we urge everyone to test WordPress 5.0 on a staging environment before upgrading to ensure compatibility. Have thoughts regarding WordPress 5.0 or Gutenberg? We’d love to hear what you think about in the comments. Michelle Jones Creative is a Charlotte, NC website design and web development agency helping businesses elevate their online image through expertly crafted websites and digital designs. We know each client has specific needs so we offer affordable web design solutions built on the platform that best fits your business goals - Squarespace, Wordpress or Shopify.